Easy to use, easy to find, and able to assume the flavor and color of whatever liquid it’s dissolved in, gelatin is a versatile thickener for both sweet and savory cooking-it’s the secret to the shimmering glaze of a perfectly reduced pan sauce and the silky mouth-feel of an ethereal panna cotta. Mix gelatin with liquid and heat it up, and it dissolves into a thin, clear, flawless sauce; let it cool and the liquid firms up into a jewel-like solid. But as soon as that solid hits the warmth of your mouth, it becomes fluid again. Here, we’ll explain where this magical ingredient comes from, the science behind how it works, and how to successfully use it in your cooking. Gelatin is a mild-tasting protein derived from the collagen in animal tissue, and it’s the only protein with the power to thicken liquids. You can see its effect every time you roast meat. The drippings in the bottom of the roasting pan owe their slightly sticky consistency to gelatin. That viscosity allows you to boil those juices into a luscious sauce without the addition of any other thickener. It’s also why the juices set into a solid gel as they cool. Unlike starch- and flour-thickened sauces that are opaque and creamy, sauces thickened with gelatin are crystal clear and syrupy. Most gelatin is produced from pig skin, which contains about 30% collagen by weight. Collagen is the connective tissue protein that gives strength to muscles and tendons and resiliency to an animal’s skin and bones. To make gelatin, pig skin is soaked in dilute acid for about 24 hours, which unravels the crosslinking protein bonds in the collagen. The resulting free protein chains are extracted, filtered, purified, and dried into sheets or granules (powder) that are around 90% gelatin, 8% water, and 2% salts and glucose. Gelatin is unlike any other protein used in the kitchen. Typically, food proteins respond to heat by unraveling, then bonding to one another and coagulating into a firm, solid mass. For example, think of a frying egg. The liquid protein of the white, called albumin, firms up into a solid mass of egg white as it heats. But gelatin proteins don’t readily form bonds with one another. Heat causes them to initially unravel and disperse just like any protein. They never form new bonds, though, so the liquid in which they’re dispersed stays fluid. Because gelatin proteins are long and stringy, they tend to become interwoven, causing the hot liquid in which they are suspended to thicken, but not completely solidify when warm. As gelatin cools (as in a pan of cooled meat drippings), the protein strands line up next to each other and twist into long ropes, transforming the liquid into a firm gel. 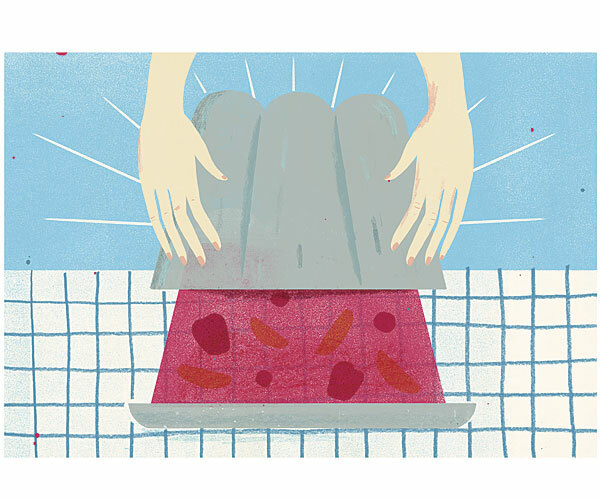 How should gelatin be handled in the kitchen? First, soak gelatin in cold water or another cool liquid to hydrate its dried protein network so that it dissolves easily. (If you add gelatin directly to hot liquid, it will stick together and form lumps.) After soaking, simply heat the water/gelatin mixture (or add hot liquid) and stir to dissolve the gelatin. Gelatin is hygroscopic (it absorbs and retains water easily), so it’s best to store it in an airtight container in a dry, well-ventilated area. When stored this way, it has an indefinite shelf life. What’s the difference between sheet and powdered gelatin? Chefs generally prefer sheet gelatin to powdered gelatin because sheet gelatin has less surface area, so when the hydrated sheets are stirred into the hot liquid, less air becomes incorporated, creating better clarity in the finished gel. Sheet gelatin isn’t as readily available as powdered, but you can easily substitute powdered for sheets using this equation: 4 gelatin sheets = 1-1/4 oz. envelope (2-1/2 tsp.) powdered gelatin. That’s enough to lightly gel about 2 cups of liquid, creating a 1-1/2% gelatin solution, which is perfect for savory sauces and glazes. For a firmer effect, such as that in a typical gelatin dessert, use the same amount of gelatin to gel 1 cup of liquid, creating a 3% gelatin solution. Are there vegetarian alternatives to gelatin? Yes. Vegetarian substitutes for gelatin are made from carbohydrates rather than proteins. The most common vegetarian gelling agents are agar (aka kanten) and carrageenan (aka Irish moss), both extracted from red algae, a type of seaweed. Popular in Asian cooking and widely available in health food stores and Asian markets, agar works much like gelatin in that it’s soaked in cold water and dissolved in hot liquid, which then firms up into a gelled solid upon cooling. The main difference for the cook is that gels made with agar must be boiled to completely dissolve the carbohydrates, whereas gels made with gelatin actually weaken if the mixture is boiled. The other difference is that while gelatin melts near body temperature (95°F to 100°F), agar melts at about 185°F, so agar gels will not melt into a tongue-coating liquid in your mouth. Agar gels also tend to have a more fragile and crumbly texture than gelatin gels. However, agar has an even greater gelling capacity than gelatin-you need only about 1/2 teaspoon of agar powder to firmly gel 1 cup of liquid as opposed to 2-1/2 teaspoons for powdered gelatin. Carrageenan (Irish moss) has a unique property: It can thin under pressure, yet return to its original viscosity once the pressure is released. For this reason, it’s often used in industrial food production, where it can be pumped through factory pipelines without losing its thickening ability. It’s a preferred thickener for ice creams and bottled sauces. There are three classes of carrageenans: kappa, iota, and lambda. Kappa carrageenans produce firm gels; iota carrageenans produce softer, more elastic gels; and lambda carrageenans gel only when mixed with proteins, such as those in dairy products. Some studies suggest that carrageenans may result in the development of gastrointestinal inflammation; however, the Federal Drug Administration and the National Organic Program currently consider carrageenans safe for human consumption. Avoid heating gelatin over high heat or for long periods of time, both of which weaken its gelling ability. It’s best to add dissolved gelatin to liquids that have already been boiled or simmered. The same goes for reheating sauces thickened with gelatin-heat gently to avoid weakening the gel. Salty or acidic ingredients tend to soften gels, so you may need to use more gelatin when working with them. Sugar or cream helps firm up gels. Sugar is hygroscopic and pulls water from the gelatin molecules, strengthening their gelling effect, while cream makes the mixture more viscous, which thickens the mixture overall. Avoid freezing gelatinthickened liquids, which causes liquid to seep from the gel when it is thawed. Certain fresh ingredients- peaches, pineapple, papaya, mangos, melons, kiwi, figs, prickly pears, and ginger- contain enzymes known as proteases, which will digest the proteins in gelatin. As a result, gels made with these fresh ingredients may not thicken properly. To neutralize the enzymes, boil the cut up ingredients for 5 minutes before using in a gelatin dessert, or use canned fruit (which has been heated during the canning process). To suspend solids in a gel, let the gel cool until semifirm before stirring in the solids. To release a chilled gel from a cup or decorative mold, dip the cup or mold in warm water for 5 to 10 seconds to reliquefy the outer edges of the gel, then loosen the edges by shaking or using a thin knife and invert. I’m just curious if it can get moldy one in the form of gelatine if not in an air tight container. And how long is indefinite? Lol. Thanks! I have a question about your comment: “After soaking, simply heat the water/gelatin mixture (or add hot liquid) and stir to dissolve the gelatin. Gelatin is hygroscopic (it absorbs and retains water easily), so it’s best to store it in an airtight container in a dry, well-ventilated area. When stored this way, it has an indefinite shelf life.” Is the shelf life indefinite after the gelatine powder is made in contact with the water (when it’s actual form of gelatine)? Thanks! If someone can help me i wish to make very very strong holdable if i add some gelatine into redymade styling gel and slowly heat up.Wil it make the gel more hold or you can sugest sokething else. Ineresting info. I wanted to make some elderberry gummies, then freeze them for when needed. You say that liquid seeps from frozen liquids with gelatin when thawed. Do you think they would still look decent enough to eat, or would the liquid seeping make it a sloppy mess?